Kodumudi Temple, one of the seven shrines of Siva celebrated in Thevaram, has all the spiritual significance of a holy temple due to its association with the idol, location and river as indicated by Thayumanaswamigal. Kodumudi, situated on the banks of the Cauvery, is 40 km from Erode on the Trichy-Erode railway line. Buses also ply from both Erode and Trichy to Kodumudi. The shrine is glorified by the celestial songs of Appar, Sundarar and Sambandar, the great saints of Saivism. Perhaps this is the only shrine in Kongunadu where the Trinity of Hinduism — Brahma, Vishnu, and Siva, together with Ambal, are worshipped. A Pandya king named Malayadwaja Pandiyan built the three Rajagopurams of the shrine. Since the Pandya kings took keen interest in the temple and attended to the renovation work time and again, the place came to be known as Pandi Kodumudi. 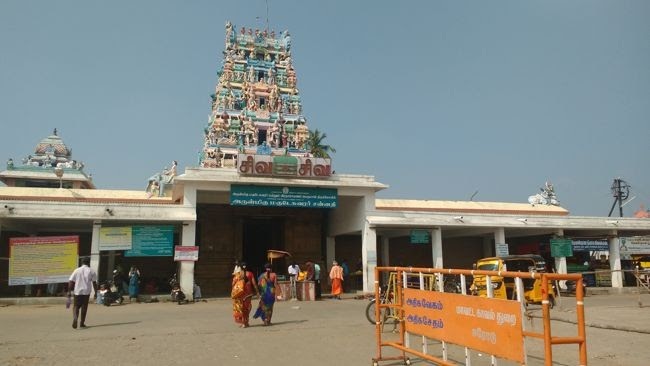 The main shrine is flanked at the entrance by the Moon God and the Sun God who are supposed to be the two eyes of Lord Siva, along with the God of Fire on His forehead. In the sanctum sanctorum is enshrined the Lord in the form of a Lingam, which emerged on its own. 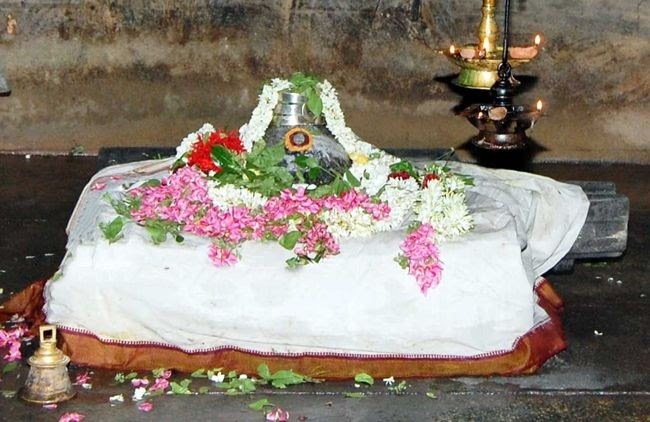 Legend has it that Sage Agasthya embraced the Lingam so closely that it bears the fingerprints of the sage even today. The 63 saints of Saivism (Nayanmars), Vigneswara and Umamaheswara, the sand-Linga improvised and worshipped by Agasthya, and Lord Subramanya with His two consorts Valli and Deivayanai have all niches of their own in the outer prahara. The inner prahara houses the idols of Lord Nataraja and Goddess Sivakami. The shrine of Ambikai (consort of Siva) is located at the south. The goddess is known by the names of Soundarambikai and Panmozhiyal. 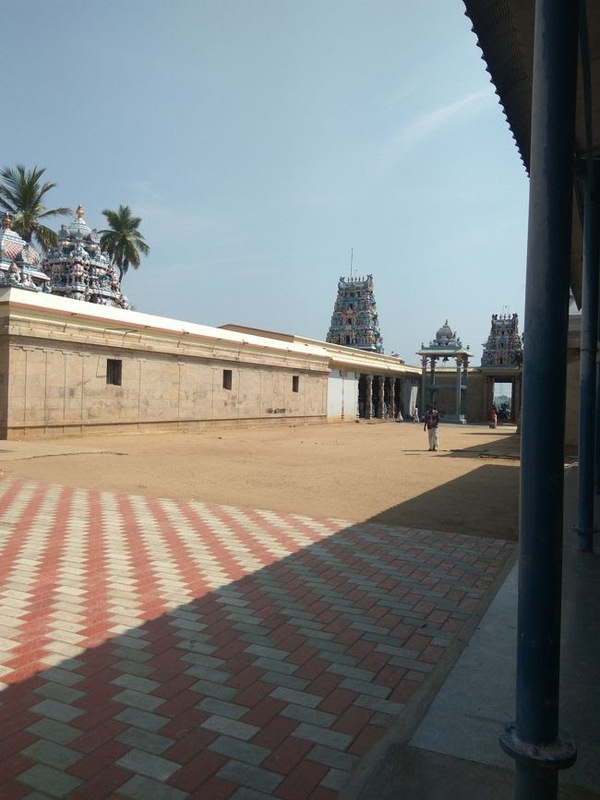 At the rear of the temple, in between the shrines of Lord Siva and Goddess Ambikai, is located the temple of Veera Narayana Perumal reclining on the serpent, Adi Sesha. Beside Him are the images of Hanuman, Vibhishana, Paravasudeva, Narada, Sri Devi, Bhudevi and Garuda. To the right side of the shrine is the idol of Thirumangai Nachiyar. On the northern side is the sacred tree of the temple, Vanni. When the temple was renovated, a number of beautiful bronzes were unearthed. Of them, the icons of Thripuranthaka, Somaskanda, Appar, Sundarar, Thirugnana Sambandar and Manickavachakar are the main attractions. An interesting phenomenon of the temple is that the sun's rays fall on the images of the presiding deities of Lord Siva and Goddess Ambikai for four days in the morning during the Tamil months of Avani and Panguni. The Vanni tree here is considered ageless and is very holy. While one side of the tree is with thorns, the other side is without them. This is explained as one part Brahma and other Saraswathi. This tree does not flower or offer any fruits and only the leaves are used for all purposes. These leaves even if immersed for years in water, do not get spoiled. In fact the devotees from this area who go for Pazhani Kavadi Yatra, put some leaves in their pot carrying the Cauvery water to Pazhani. Going around this Vanni tree for kaal, arai and muzhu mandalams (12, 24 and 48 days respectively) or the age of the person or 108 times, is considered very auspicious. Special prayers and abhishekam are performed to this Brahma on Mondays. Those who are having ill effects of Shani or those born in Avittam star (Sravishta), get lot of benefits by praying to this Brahma. The familiar legend of the contest between Vayu and Adisesha is repeated here also. It is believed that five of the gems on the head of Adisesha fell on five different places - red stone in Tiruvannamalai, Emerald in Thirueengoimalai near Kulithalai, Blue stone in Kuttralam, Manikkam in Vatpoki (Sivayamalai) and the diamond in Kodumudi. Agasthyar is believed to have prayed here on his way to Pothigai Hills. 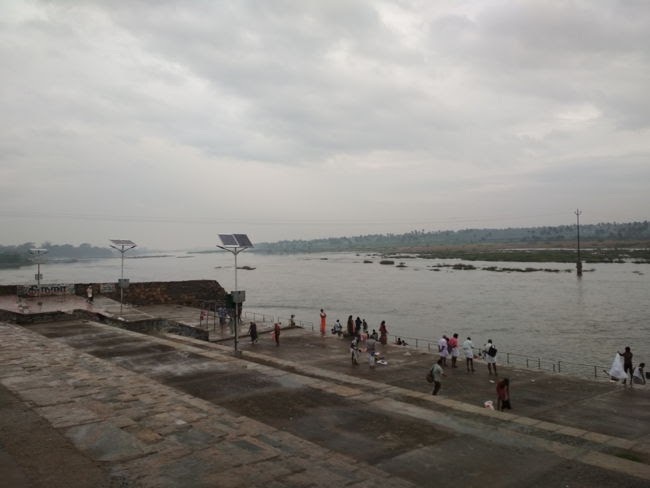 Here Cauvery river takes a 90 degree turn from South to East and this turn is attributed to Sage Aasthyar whereas some other legends attribute this is to Veeranarayana Perumal who prevented the Cauvery from flooding the town by turning its direction. 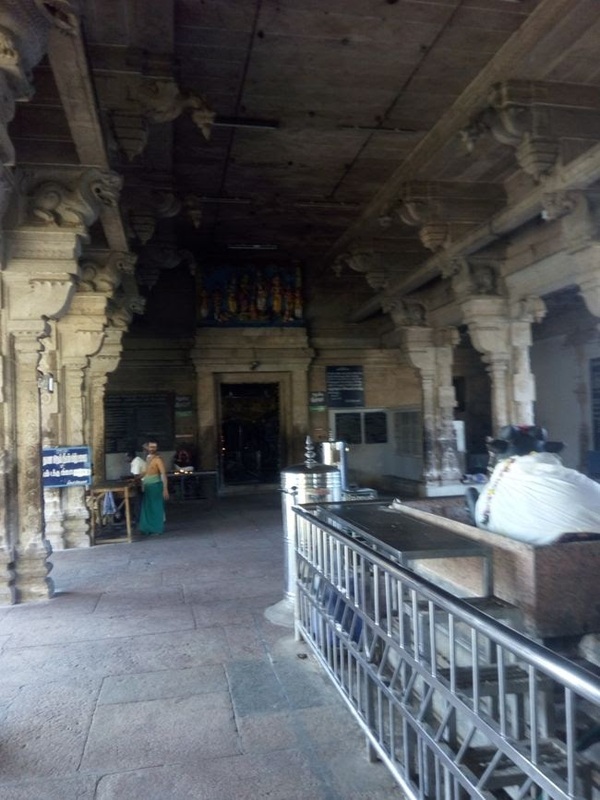 Apart from Cauvery which is one of the Theerthams, there are several other theerthams within the temple like Bharadwaja, Brahma and Deva Theerthams. Since the Trimurthis are present in this temple, all the festivals connected with them are being observed here. Though there are several Ganeshas in this temple, the most important one is called Kaveri Kanda Ganesan (One who has seen Cauveri). Performing abhishekam to the Vinayakar with number of pots equivalent to one’s age, is considered very important in this temple. Another special Vinayaka in this temple is called Vyakrapada Vinayaka as He is having the feet of a tiger and this Murthy appears in one of the pillars! This kind of Murthy is not seen in any other temple. Kodumudi is an important station in the Erode-Karur train and road routes. It is also the birthplace of the famous singer Smt K B Sundarambal where K stands for Kodumudi. This is a rare place where all the thrimurthis are worshipped. Though the Devasthanam is called Shree Magudeshwarar and Shree Veeranarayana Perumal Temple, Brahma is also present here. Hence it is also called Mummorthi temple. From various parts of Tamilnadu buses are available and the main and nearest Bus stand is Karur which is 28km and other city is Erode which is 37km, so reaching the temple is never a big task at any time.